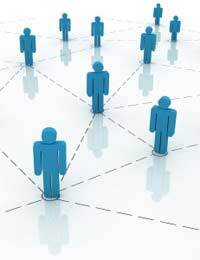 Home > Changing Technology > Do Social Networking Sites Change the Way We Work? Social networking sites are generally thought of as the province of the young. It’s where they connect with their friends, arrange their social lives, chat and discover new people and even romance. That, at least, is the conventional wisdom. But it’s not quite correct. Millions of people of all ages use these sites. They’ve been massively popular very quickly, in ways no-one could have predicted. But how does that affect work? Whether employers approve or not, employees will sneak personal time on work computers (unless, of course, there’s an official policy against it, and even them some will try). In many ways social networking sites can be quite addictive, logging on every few minutes to see what your friends might be doing, how they’ve updated their status, and some people do access them from their desks several times a day. That cuts into work time, but with so many people doing it, often employers have had to reach a compromise. Giving employees time when they can access the Internet for personal reasons can actually make them more productive. If they don’t feel they have to sneak around when doing it, but are given an allowance of time each day, then they will work harder the rest of the time. It works to everyone’s advantage, and happy employees will work harder. People post a lot of information about themselves on social networks (putting too much on isn’t a good idea, especially things like full dates of birth, phone numbers and more; if there’s enough it can be used for identity theft). They talk about their education, things they’ve done, both good and bad, join groups in the social network and more. What job candidates have found is that employers have started checking social networking sites before interviews, which means that some of the bad or stupid things they’ve reported on their profiles have come back to haunt them, and might even have a bearing on whether they’re offered a position. It can also end a job, as some airline employees have found. They started a group on a social networking site, complaining about passengers and more. However, it came to the notice of their employers, and some of the employees were disciplined while others lost their jobs. Put it all together, and you need to remember that social networking sites are very public places, and what you write is available to a lot of people – so you need to be very careful when it comes to what you reveal, whether personally or about work. Social networking sites can be excellent for business networking, too, whether it’s on a one-to-one level with contacts, or rapidly putting together groups on the site relating to industries or events. They’re a good, quick way of disseminating information to a number of people and putting them together in one virtual place without having to create your own site or contribute to forums. There are also specialist business social networking sites that are very useful not only for networking, but also when job hunting. They’re effective for posting your CV and keeping you in contact with those in your field and outside it. Used wisely, social networking sites can offer a lot to work, by making employees feel appreciated and privileged, and also to help the ongoing necessity of networking for businessmen.